Microdosing weed has become a minor trend with humans lately, but the science on its actual benefits is fairly shaky. Now, in a newly published study by a group of scientists in Germany, evidence shows that older mice may experience a reversal of brain aging and a restoration of the ability to learn. To test their hypothesis, researchers regularly gave all three age groups of mice a dose of cannabis that would be too small for them to get high. They did this for a month before putting their subjects to the test. They observed the abilities of the mice to run mazes and how well they recognized each other. What emerged was surprising. The control group of mice that hadn’t received a dose of cannabis performed as expected—the young mice outperformed the middle-aged and elderly subjects across the board. 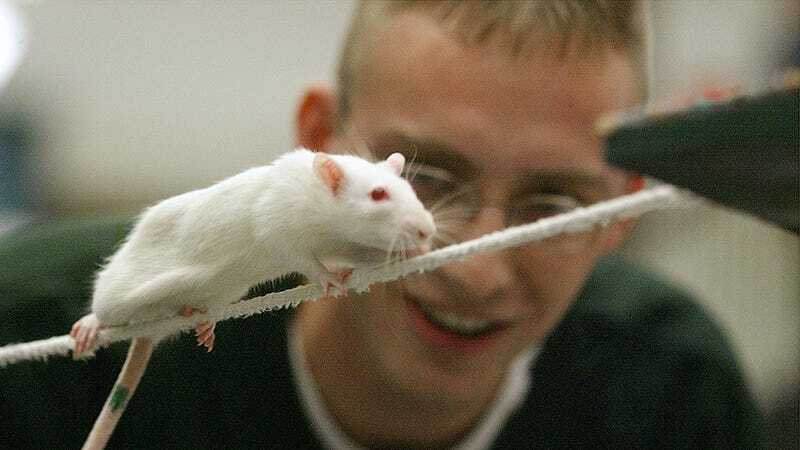 But in the group of microdosing mice, the middle-aged and elderly mice were able to do as well in the tests as the young mice in the control group. That brings us to the catch. Younger mice that were given small amounts of THC demonstrated lower performance capabilities. This falls in line with studies that have found adolescent humans experience a decline in their attention, learning, and memory abilities after cannabis consumption. The jury is still out on whether or not those effects are long term. Most studies have also focused on dosages that provide a psychoactive effect. As the group continued their research, they found that THC caused an increase in connections between brain cells in the hippocampus. That region of the brain is associated with memory formation. Additionally, they note that the endocannabinoid system is more active in young mice and the THC could be overstimulating it. That would account for the decline in attention in the younger mice. But middle-aged and elderly mice have a less active endocannabinoid system, so the weed might just be leveling them out. The team plans to do a human trial next, and we could soon have much more concrete data on the benefits of microdosing cannabis as well as the variations in benefits based on age. Zimmer tells New Scientist that people should keep in mind that this is very different than smoking weed. Microdosing advocates recommend a 3 mg dose of THC each day, while the standard for getting stoned with edibles is considered 10 mg.
Have you ever read an article... on weed?